Eleventh Street Family Health Services of Drexel University, at 850 N. on the eponymous street, received a $2.5 million donation from the Sheller Family Foundation Feb. 17. The health center is expected to use the money to help add a new wing to its building, which is to be renamed the Stephen and Sandra Sheller 11th Street Family Health Services Center. Currently, the center provides primary care services from nurse practitioners as well as integrated behavioral health consultations. The new wing, which will continue that mission, is expected to be completed in two years. According to Gerrity, all of the primary care is going to move into the new building. There will also be an expansion of different units to the center, from pediatrics to art therapy. The expansion will also include a new yoga studio and an expanded fitness center. Currently, three Drexel co-op students are employed at the center. These students are from multiple fields of study. The expansion will add new classrooms, video supervision, and other opportunities for students and research in the new wing. Before this expansion, co-op students would not have the opportunity to be taught all of the different fields of therapy, Gerrity said. “We’ve had a long-term relationship with the Shellers,” Gerrity said of the couple that donated the funds. Sandra Sheller, co-founder, director and president of the Sheller Family Foundation, is a Drexel alumna in creative arts therapy (‘04) and couple and family therapy (‘05) from the College of Nursing and Health Professions. Her husband, Stephen Sheller, is a co-founder of the foundation, a Drexel trustee and an attorney. “[Sandra Sheller] has a great deal of expertise on maternal detachment and traumas, so she’s worked with us, headed programs here and helped staff [to] develop programs. She’s helped supervise creative arts students here. She’s gotten to know us over the years,” Gerrity said. The Shellers have donated money to the 11th Street Center on other occasions and have gathered other supporters for the health center. The health center was opened in 1996 under the College of Nursing and Health Professions. The site was temporary until the building where it resides today was built in 2002. Originally opened with a staff of five people, the health center has expanded to 55 employees. “We’re totally out of space. We see about 6,000 patients a year. We had 32,000 clinical visits last year,” Gerrity said. The health center, along with offering primary care from nurse practitioners, has a physician co-operator provided by Drexel. The center also works in education and research. 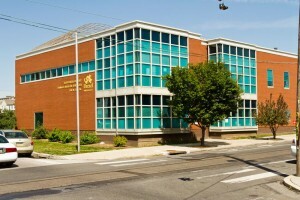 The health center also has a teaching kitchen, a nutritionist, cooking classes, an urban farm, a fitness center, a full-time health coach, physical therapists from the CNHP, nursing faculty who make home visits, general social workers, some connections to the Drexel School of Law, mind-body therapists who work with things like yoga and stress-relief, prenatal care, midwives and child care. It works with Philadelphia’s Mural Arts Program in order to provide the best care for the neighborhood around it. The center is partnering with the Philadelphia Public Housing Authority to create a community center and make a “health campus,” which would include green space and apartments for homeless veterans. “Our patients have suffered a great deal of trauma, both family trauma and community trauma and violence,” Gerrity said. Drexel President John A. Fry is supplying the health center with funds to receive a sanctuary certification, to provide an organizational approach to trauma healthcare.